Leroy Strand was prosperous, yet prudent. With the success of his cattle ranch at Geyser, he had accumulated a great deal of wealth, but he didn’t spend it frivolously. Every purchase was made with forethought. Strand didn’t buy something unless he saw lasting value in it. 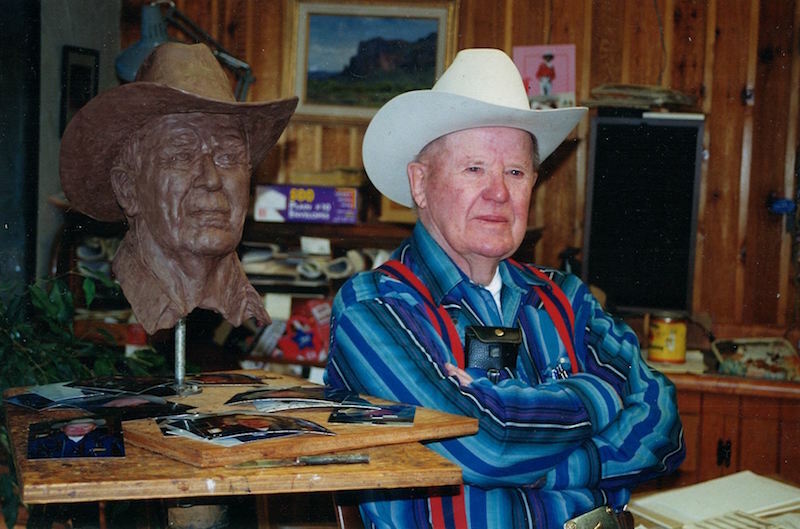 Contway is a bronze artist who grew up on his family homestead near Malta, where they raised horses, cattle, and sheep. Later, he became a rodeo champion, and later still, he bred horses with his wife, Lynn. These experiences inform the majority of his works, the authenticity of which made Strand one of his biggest supporters. Contway’s art dealer introduced him to Strand in the late 1970s. Though they both lived in Montana, their first encounter was at the Brown Palace Hotel in Denver. Twice Strand posed for a Contway sculpture. The first was Cuttin Horse. (For this, Strand sat atop a saddled saw horse so that Contway could accurately sculpt the pose.) The second was a bust of Leroy around age 70. Contway’s son, Ross (also a local bronze artist), helped him quickly block out the sculpture as Strand sat patiently. Every now and again, Strand would drift off to sleep and Contway would have to nudge him awake to keep going. Upon completion, only two of the bust were cast—one for Strand and one for his wife’s daughter-in-law. Strand’s was later donated to the C.M. Russell Museum, along with hundreds of other artworks. Of the some 400 objects donated to the C.M. Russell Museum by the Strand Foundation, an overwhelming number are bronzes, a majority of which were sculpted by Contway. At the time of his death in 2016, Strand owned well over 100 of his works. “I think he wanted to see this work preserved. He enjoyed showing it to people,” says Contway. The current installation of The Strand Collection will be on display for visitors of the C.M. Russell Museum through December 2018. “It’s as good a collection of Western art as any in the United States,” says Contway.